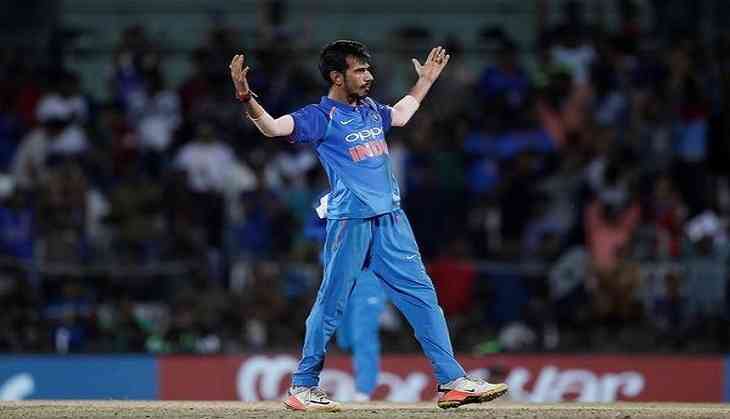 Wrist spinner Yuzvendra Chahal ripped through South African batting line with his maiden five-wicket haul, as the hosts were bundled out for just 118 in the second ODI of the six-match series at the SuperSport Park here on Sunday. After asked to bat first, Hashim Amla and Quinton de Kock came out to open for South Africa. India got the first breakthrough as Bhuvneshwar Kumar dismissed Amla for 23. Quinton de Kock was then caught out on 20 of Chahal's ball. Another wrist-spinner, chinaman Kuldeep Yadav, got off to a terrific start and sent back stand-in-skipper Aiden Markram for 8. He then claimed David Miller for a duck. South Africa, which is suffering from injury woes as both their star players, captain Faf du Plessis and AB de Villiers, are not playing, lost six wickets in last six overs. JP Duminy hit 25; Khaya Zondo who replaced injured du Plessis to make his ODI debut scored 25 and Chris Morris struck 14 before the three were dismissed by Chahal. Yadav chipped in two wickets, while Japrit Bumrah claimed one. Chasing down the target, India were on 26 in 3.3 overs after losing opener Rohit Sharma on 15. Shikhar Dhawan was batting on 8 at the time of filing the report.